The Baltic Smart Water Hub is a multifunctional online portal aiming at connecting water experts in the region. 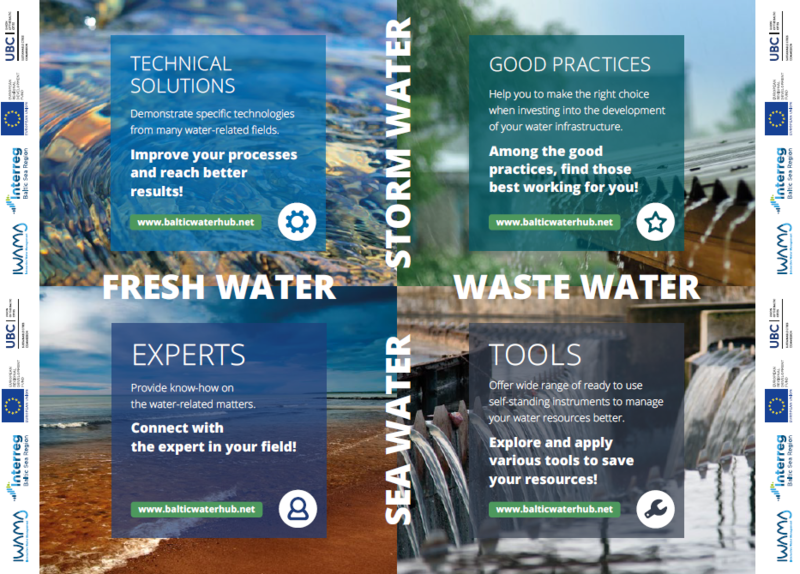 The Hub provides most recent good practices, technical solutions and tools on a broad array of water-related issues such as wastewater treatment, storm water management, fresh water solutions, river-basin and lake areas management. The Hub is developed and maintained by the Lead Partner of IWAMA, UBC Sustainable Cities Commission. The Hub´s target groups consist of water companies and associations, relevant departments of local authorities, academia and students engaged in water fields, private companies producing clean-tech and innovative water-related solutions, as well as NGOs and other initiatives and foundations working with water issues. The Baltic Smart Water Hub is a place of technical expertise and a database of exemplary solutions existing in various water sectors in the Baltic Sea Region. The Hub structure follows four water areas, in which the information is presented: fresh and sea water, storm water and wastewater. The Hub comprises of four core elements, through which actors can cooperate, share and learn: good practices, technical solutions, tools and experts. Each section has a unique set of content tested and implemented by forerunner organizations from the Baltic Sea Region. Good practice cases presented in the Hub illustrate processes of implementing investments, piloting or innovative solutions that certain actors have tested. Technical solution describes specific technology that can be used to improve a certain process or solve a specific problem. Tools available via the Hub are self-standing instruments that can be downloaded or reached through the source and immediately applied by the end users. Through the demonstrated cases, Hub users can find ideas for investments, measures to optimize processes, solutions to similar challenges and tools to use in the daily work. Users of the Hub can also learn about existing funding instruments in the Baltic Sea Region, regional policy framework and potential networking associates. Users are encouraged to submit their own content to the Hub through an online form and by doing so promote their organisation´s expertise in the region. The portal is continuously expanding with novel tested solutions, providing users the best variety of available water management related information around the Baltic Sea Region.